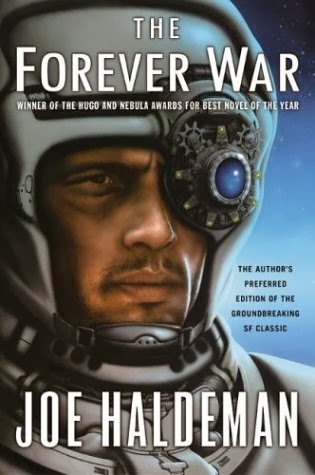 Sure this has your typical space wars that were popular in mid 20th century sci fi but what makes this book stand out is the time dilation and it's effects. When the soldiers return home approximately 60 years have passed during their two year tour and much on Earth has changed. So many people so lacking food and the basic necessities that they are more than willing to kill others for what they have. Overpopulation and lack of medical care for the majority of it. Sound familiar? Acclimatization is rough and trying to just live a regular life is seemingly impossible so the only logical step is to re-enlist. Haldeman has done a great job of showing the culture shock that some historical soldiers faced when returning home from war. He's using space as a backdrop but the story remains the same. He conveyed Mandella's confusion with the changes very believably. I also found his solution for overpopulation unique and interesting. Outlawing heterosexual couples to curb population growth would certainly be one way to deal with things. I also liked how Haldeman ended the story. It was both plausible and satisfying. 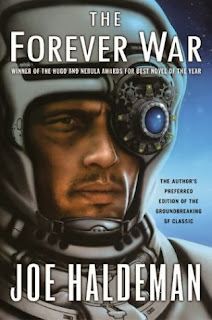 A classic science fiction well worth the read.